This 5-day course addresses all of the Information Management disciplines as defined in the DAMA body of knowledge (DMBoK). Taught by an industry recognized DAMA DMBoK(2.0) author and CDMP(Fellow) this course provides a solid foundation across all of the disciplines across the complete Information Management spectrum. By attending the course, delegates will get a firm grounding of the core Information Management concepts and illustrate their practical application with real examples of how Information Architecture is applied. Additionally this course provides a solid foundation for students wishing to consider proceeding to take the Industry professional DAMA CDMP certification. What is the DMBoK, its intended purpose and audience. Changes in DMBoK 2.0, and the relationship of the DMBoK with other frameworks (TOGAF / COBIT etc.). DAMA CDMP professional certification overview & CDMP exam coverage by DMBoK section. Why Data Governance is at the heart of successful Information Management. DG roles & responsibilities, the role of the Data Governance Office (DGO) & its relationship with the PMO. How to get started with Data Governance. The Dimensions of Data Quality, policies, procedures, metrics, technology and resources for ensuring Data Quality is measured and ultimately continually improved. A DQ reference model & how to apply it. Capabilities & functionality of tools to support Data Quality management. The differences between Reference & Master Data. Identification and management of Master Data across the enterprise. 4 generic MDM architectures & their suitability in different cases. MDM maturity assessment to consider business procedures for MDM and the provision and appropriateness of MDM solutions per major data subject area. How to incrementally implement MDM to align with business priorities. Provision of Business Intelligence (BI) to the enterprise and the manner in which data consumed by BI solutions and the resulting reports are managed. Particularly important if the data is replicated into a Data Warehouse. Types of BI, DW and Analytics. Provision of metadata repositories and the means of providing business user access and glossaries from these. The development, use and exploitation of data models, ranging from Enterprise, through Conceptual to Logical, Physical and Dimensional. Maturity assessment to consider the way in which models are utilized in the enterprise and their integration in the System Development Life Cycle (SDLC). What are the business (and technology) issues that Data Integration is seeking to address, the different styles of Data Integration, their applicability and implications. The approaches, plans, considerations and guidelines for provision of Data Integration and access. Consideration of P2P, ETL, CDC, Hub & Spoke, Service-orientated Architecture (SOA), Data Virtualization and assessment of their suitability for the particular use cases. 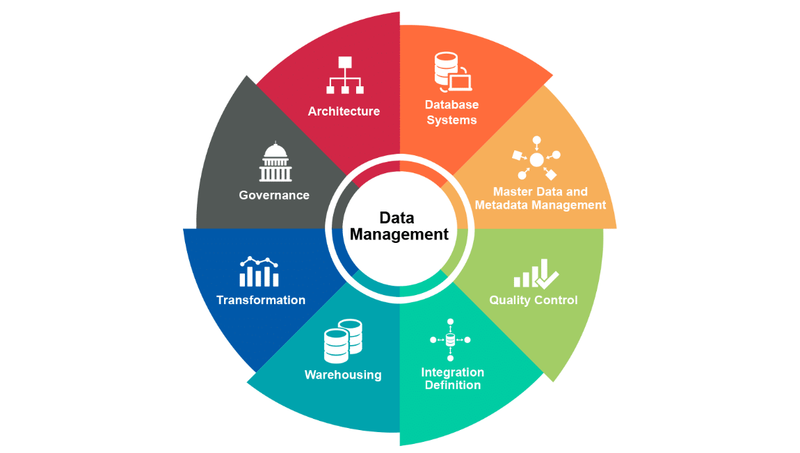 Proactive planning for the management of Data across its entire lifecycle from inception through, acquisition, provisioning, exploitation eventually to destruction. This IM discipline and its maturity assessment determine how well this is planned for and accomplished. Identification of threats and the adoption of defences to prevent unauthorized access, use or loss of data and particularly abuse of personal data. Exploration of threat categories, defence mechanisms & approaches, and implications of security & privacy breaches. Identification of risks (not just security) to data and its use, together with risk mitigation, controls and reporting. The polices and assurance processes that the enterprise is required to meet. Adapting to the changing legal and regulatory requirements related to information and data. Assessing the approach to regulatory compliance & understanding the sanctions of non-compliance. Examination of the categories of tools supporting the IM disciplines. How to select the appropriate toolset. Discussion of an example policy for use of specific technology to ensure consistency and interoperability across the enterprise.